Roserade in game: 373 Who? Important notice! Pokemon Roserade is a fictional character of humans. Roserade (Japanese: ????? 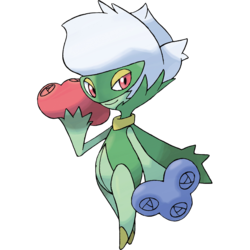 Roserade) is a dual-type Grass/Poison Pokémon introduced in Generation IV. 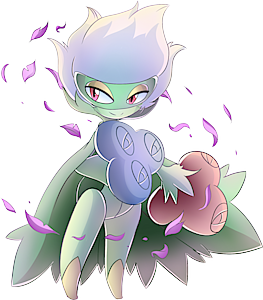 Roserade is a bipedal Pokémon with an appearance that incorporates features of roses and masquerade attire. It has hair made of white rose petals, and a leafy, green cape with a yellow, collar-like bangle on its neck. The cape pattern reaches toward the back of its head, in spiky, sepal-like extensions on the hair. A female will have a longer cape than a male. It has a dark-green mask over its red, yellow-lidded eyes. The lower portion of its face is light green, and it holds a bouquet in each hand. It has a red in its right hand and blue in its left. Its limbs and underside are light green. Its feet end with yellow tips. Roserade lures prey with a sweet aroma. The more toxic its poison, the sweeter its aroma becomes. Each hand has different toxins, but both hands can jab with near-deadly power. It attacks with a dancer-like elegance, and uses hidden whips lined with poisonous thorns. In Coming Full-Festival Circle!, Nando was shown to have evolved his Roselia into a Roserade. It appeared briefly alongside his Sunflora in the Sinnoh Grand Festival. It was also used in the Lily of the Valley Conference in League Unleashed!, where it battled against Ash's Staraptor and was defeated. In A Full Course Tag Battle!, May revealed that Drew had evolved his Roselia into a Roserade. It was first physically seen in Strategy With a Smile! watching the Wallace Cup along with its Trainer. 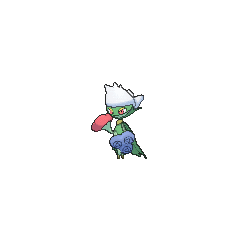 Roserade first appeared in Oh Do You Know The Poffin Plan!, under the ownership of Forsythia. Forsythia first met her Roserade when it was a Budew, where she befriended it and gave it a red scarf. This Roserade, however, was very shy and timid. Roserade also protects Forsythia's garden from being ravaged by Team Rocket. Forsythia's Roserade also made a brief appearance in Unlocking the Red Chain of Events! alongside Forsythia and her Lotad. Roserade made another appearance in The Grass Menagerie! when Ash was battling Gardenia for his Forest Badge. Roserade was able to beat Ash's Turtwig with a Weather Ball before being beaten by his Aipom. Another Roserade appeared in Barry's Busting Out All Over!, this time under the ownership of Barry. It was used in his battle against Ash. It defeated Chimchar with a barrage of Poison Jabs but tied with Gliscor from one of Gliscor's X-Scissors. It appeared again in Steeling Peace of Mind!. Another Roserade was seen in Beauties Battling for Pride and Prestige! under the ownership of Cher. She was often referred to as "Roseradette" by her Trainer. A Roserade appeared in The Rise of Darkrai as one of the Pokémon attacked by Darkrai and being treated by Alicia in Alice's flashback of her grandmother. It was put to sleep by Darkrai's Dark Void and later seen listening to Alicia play Oración alongside the other Pokémon Darkrai had attacked. A Roserade appeared in the opening of Arceus and the Jewel of Life. A Coordinator's Roserade appeared in Yes in Dee Dee, It's Dawn!, participating in a Double Performance along with a Purugly in the Daybreak Town Pokémon Contest. A Roserade also appeared in Genesect and the Legend Awakened at Pokémon Hills. Elma has a Roserade which first appeared in A Showcase Debut!, competing in the Coumarine City Pokémon Showcase. A Trainer's Rosarade appeared in Mega Evolution Special III. A Roserade appeared in Pikachu and the Pokémon Music Squad. 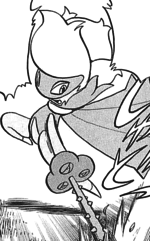 Roserade appears in Pokémon Adventures, in the Diamond & Pearl chapter. Gardenia used a Roserade alongside her Cherubi in a Double Battle against Platinum's Prinplup and Ponyta. Although it quickly gained the upper hand by knocking out the latter using its poison whips and badly beat the former using combinations of Grass Knot and the aforementioned move, both ultimately became her downfall when Platinum took advantage of the cover that the knots gave and the holes that the whips composed to deliver a finishing Blizzard that defeated both her Pokémon. Gardenia's Roserade also appears in Pokémon Diamond and Pearl Adventure!, where it defeated Hareta's Misdreavus during his Gym battle. However, before it fainted, Misdreavus used Spite, lowering the Power Points of Roserade's Magical Leaf. While at a disadvantage, Hareta's Piplup endured the rest of Roserade's Magical Leaf onslaught until it ran out, leaving it open to Piplup's Peck attack, winning the battle. Mandarin Chinese ???? / ???? Luósiléiduo Transliteration of its Japanese name. The last character ? is also a classifier for flowers.